The apartment Budva is comfortable and very spacious, over 55 m2., located in new building. The beach is only a few minutes walk from the apartment, and 10 minutes from the Old Town of Budva. Guests have free use of Wi/Fi internet, it is fully air conditioned, has a bathroom with shower, washing machine and hairdryer, one bedroom with king size beds. The apartment has one big charming balcony with a sea view. It is an ideal location for families. 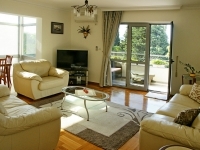 The apartment is located in the center of Budva, there are numerous restaurants, bars and shops. With a nearby bus stop, taxi stand, supermarket, shopping centre, pharmacy, tennis courts, beach and childrens playgrounds all within 100 metres of the apartment this is an ideal base to explore Budva. Parking is available in our garage.